Christmas is definitely just around the corner. How many times have you read or heard this line?! With just 29 days to go, it really is just a few more sleeps to go! In line with this, Century City Mall invited a handful of bloggers, myself included, for an evening of great food and new discoveries as we discover more reasons to #LoveChristmas. 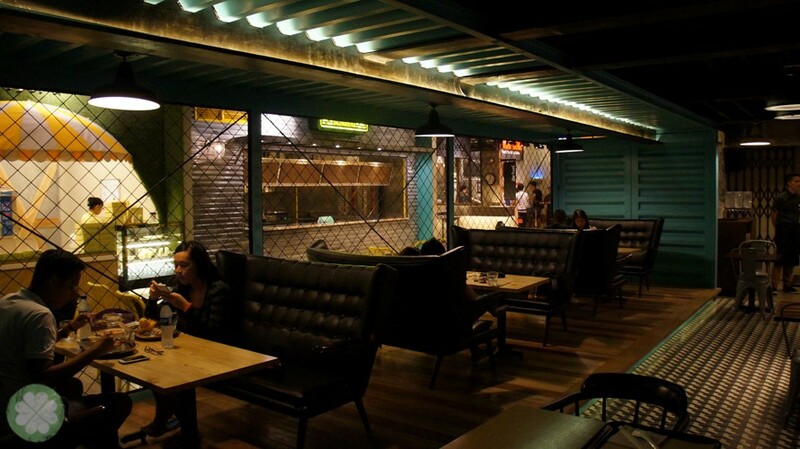 What better way to do this than to experience their not-so-hidden-gem called Hole In The Wall? 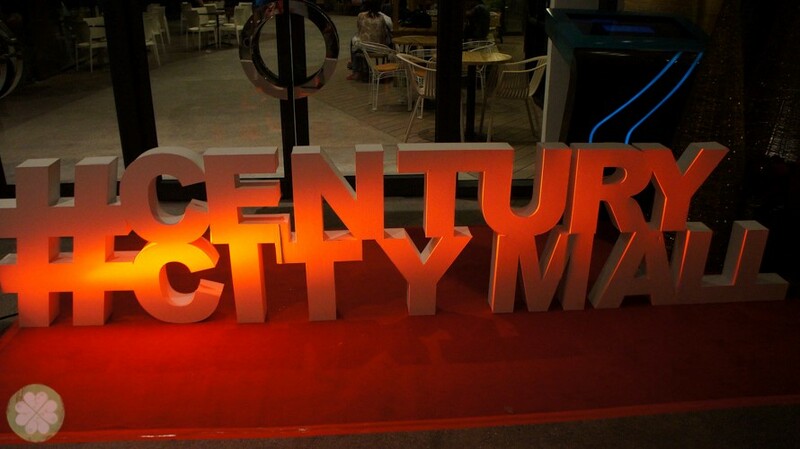 To be honest, I’ve only been to Century City Mall once since it opened. It was when Tin aka Manila Fashion Observer and I dropped by Blue Carreon Home. Since then, I haven’t been back. So last week was my second visit to Century City Mall and I was glad that a lot of stores are now open just in time to shop for Christmas. Later on this post I’ll let you in on some reasons why you should shop at Century City Mall as they’ve got awesome deals for everyone. 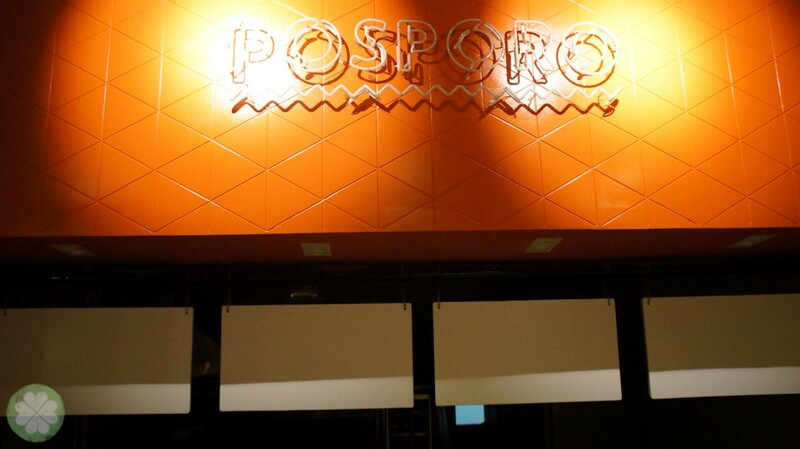 Century City Mall graciously showcased one of the reasons why one must visit their establishment. 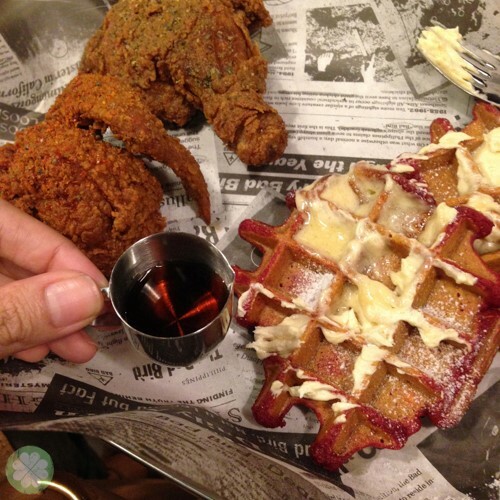 Foodies and even non-foodies, when in Century City Mall, you must dine at Hole In The Wall. 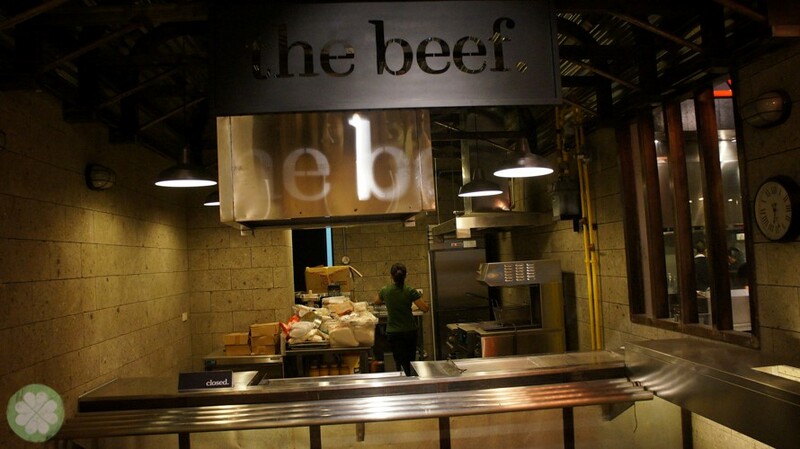 Hole In The Wall is located at L4 of Century City Mall. 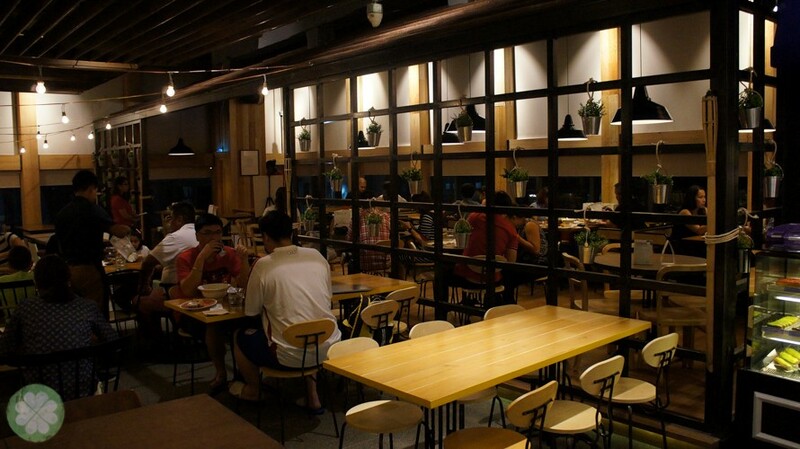 It’s an upscale food hall that houses a handful of well-curated restaurants that cater to people with different palates & preference when it comes to comforting and hearty meals. 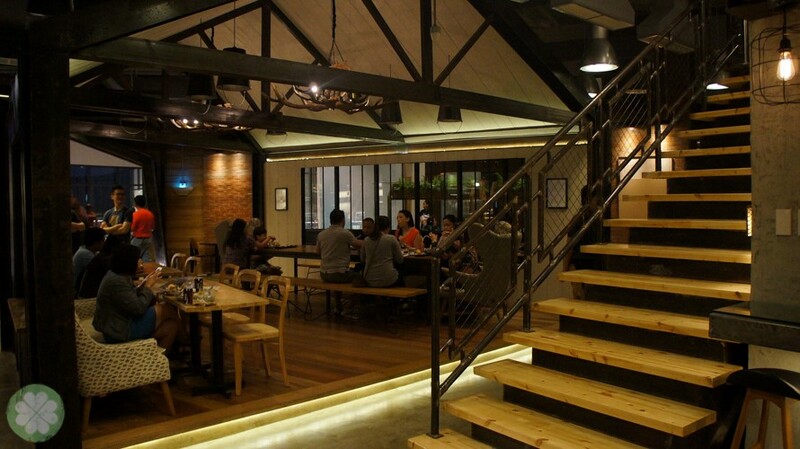 The cozy interior of Hole In The Wall reminds me of a cabin lodge or a rustic restaurant in a theme park. 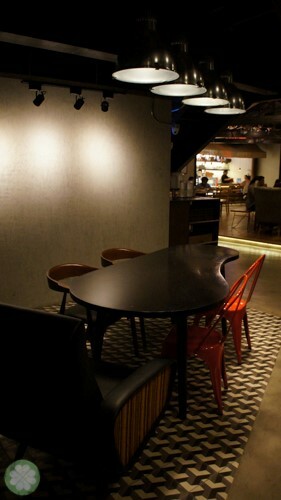 I love how sheltered and relaxed the ambience is. 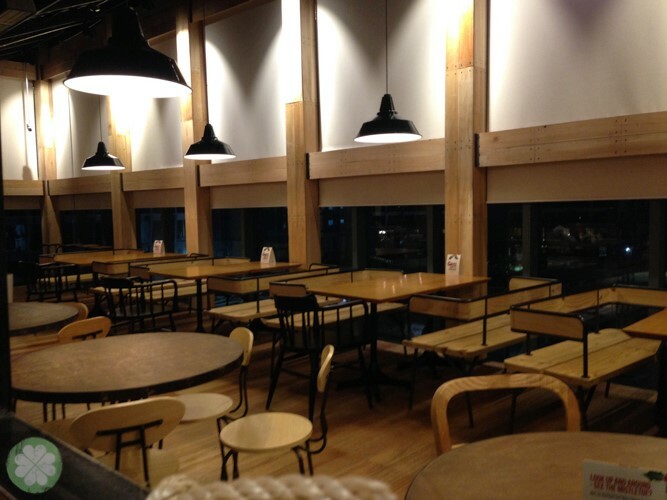 It doesn’t really feel like a food hall which is usually brightly lighten with a splash of chaotic climate. 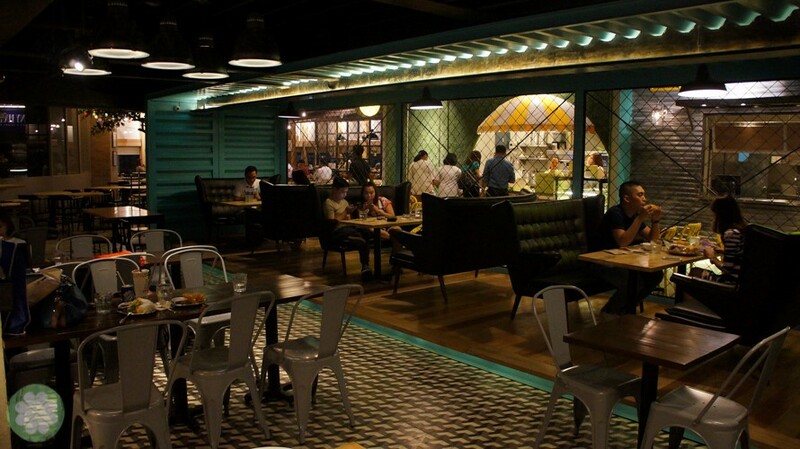 Comfy couches, lounge chairs, wide enough spaces in between make Hole In The Wall pleasant, especially for diners who want to bring their kids along with them. The staff were efficient and would serve service water only when you ask for it- I love that they do so no water is wasted. They would also immediately clean up as soon as you go and would gladly assist you should you need to have your food packed for take out. Cleanliness is next to godliness. 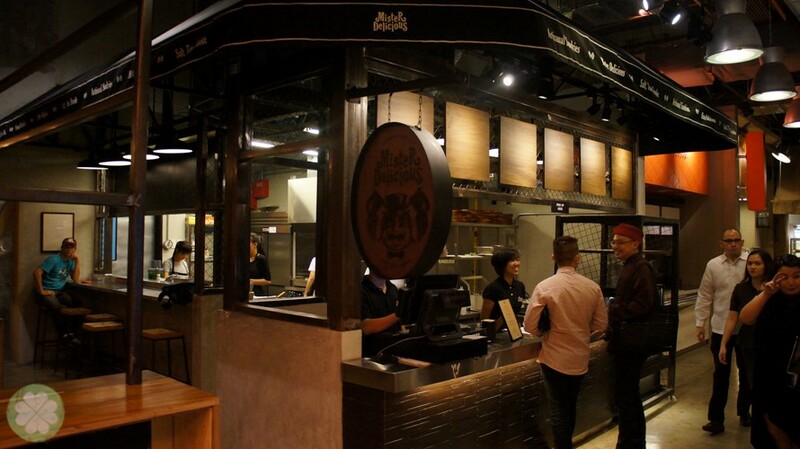 Now if all food halls were like this. 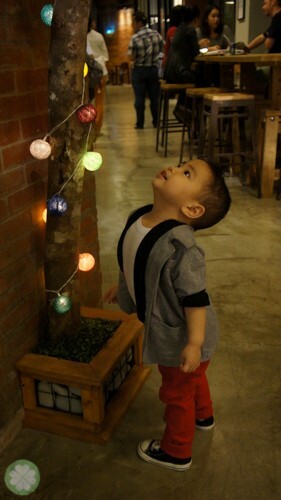 Lil’ Mr. GJG couldn’t resist the cuteness of the decor. 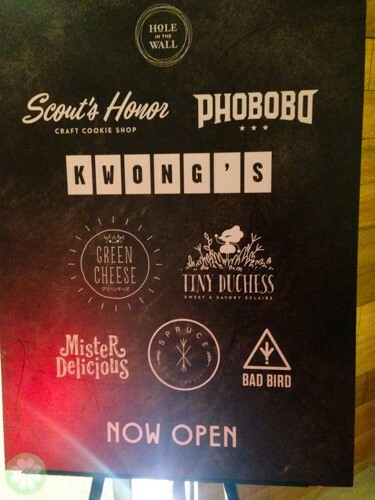 Here are the restaurants that have yet to open. 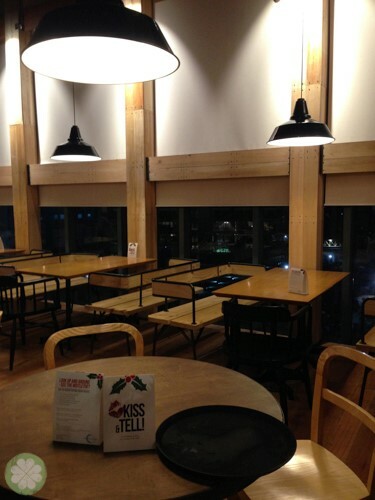 While here are the restaurants we were able to try. 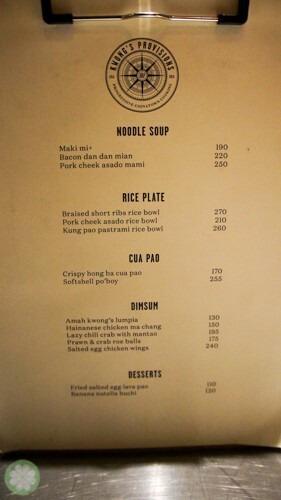 Kwong’s Provisions offers Chinese cuisine. 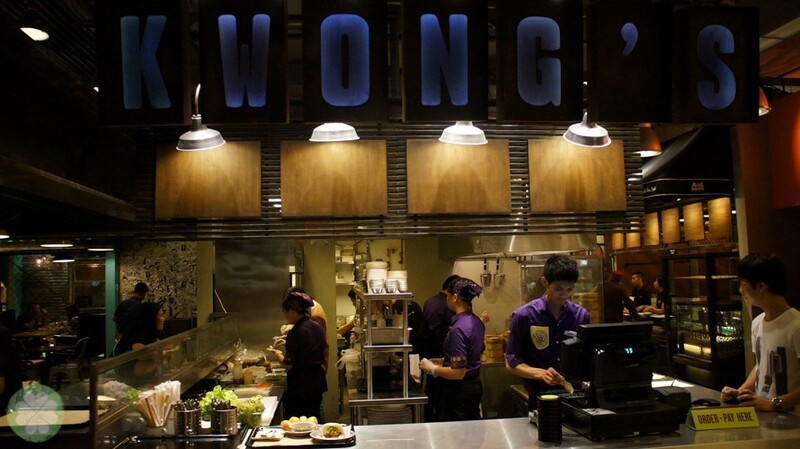 I really wanted to try all their dishes, particularly their dim sum but I was still full when I arrived at Century City Mall, coming from another event. 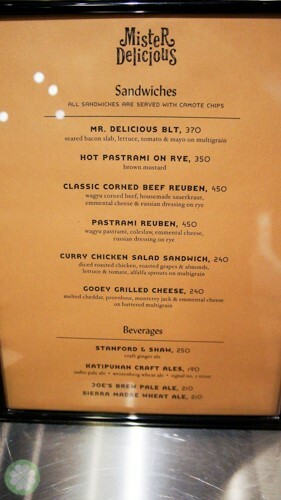 So instead, I asked which ones are their specialties for me and lil’ Mr. GJG to try. Spot the taho (soy bean snack with pearl crystals & caramelised sugar syrup) unfortunately, its only part of the decor. I wish they do sell taho as I would have wanted a cup. Heehee. Lil’ Mr. GJG loved this. We haven’t tried a maki mi with fresh bean sprouts before. 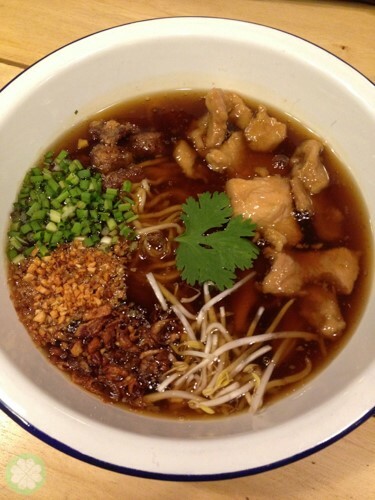 This added flavor to the dish with a hint of crunchiness. I enjoyed this dish so much that I’d be back for this. 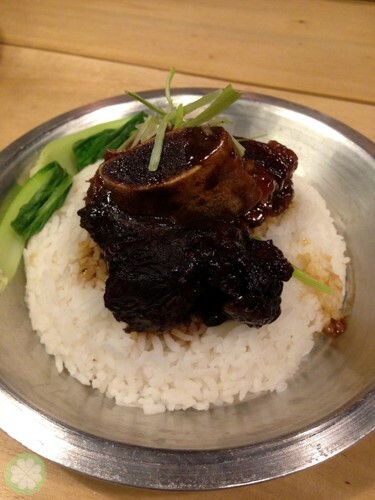 I love how tender the short ribs, it practically falls off the bone. I would however ask for an additional sauce sprinkled on the white rice. 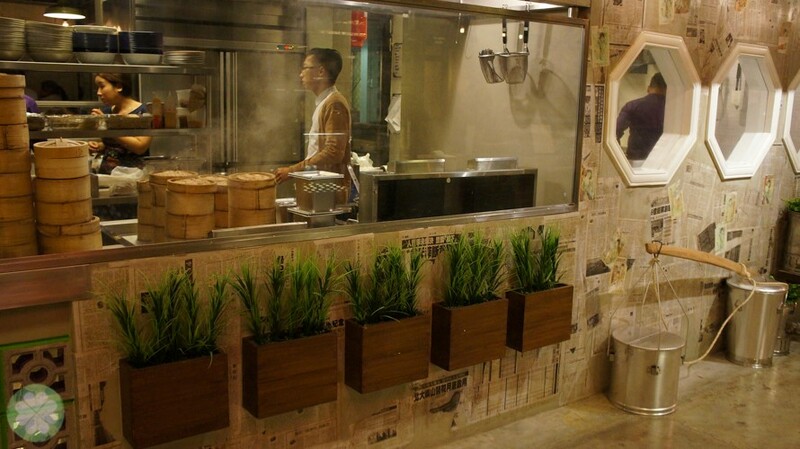 Next time I shall try Kwong’s Provisions Cua Pao & Ma Chang. 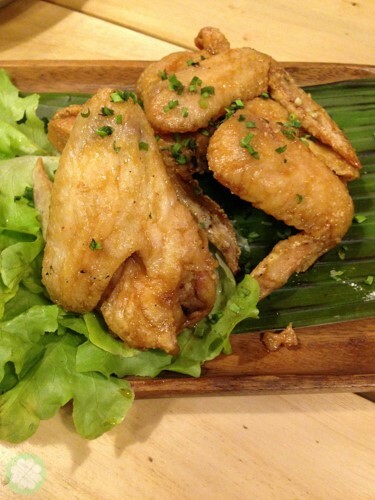 Again, I asked what’s their specialty and they gladly offered their Fresh Spring Rolls and their Palm Sugar Wings which are both good for sharing. 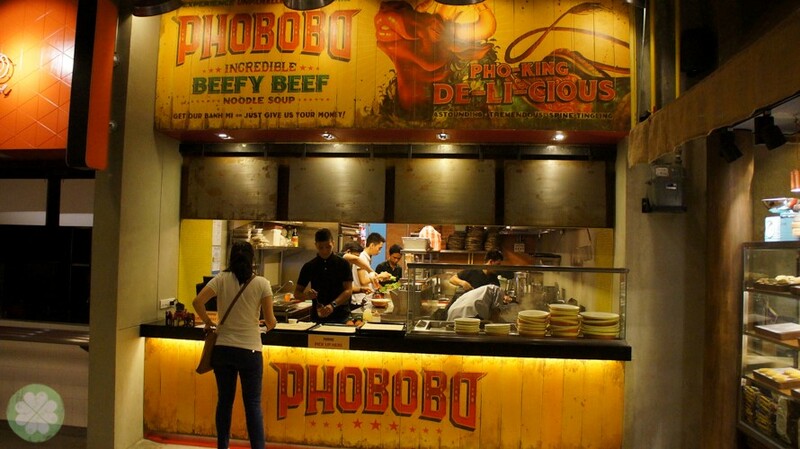 For a chicken lover like me, Phobobo’s Palm Sugar Wings was okay. It wasn’t something that I really loved as the flavor wasn’t something unusual. 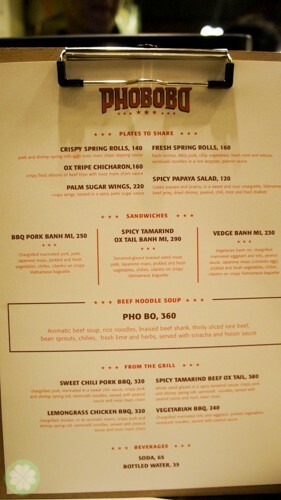 Phobobo’s Fresh Spring Rolls was something I liked. 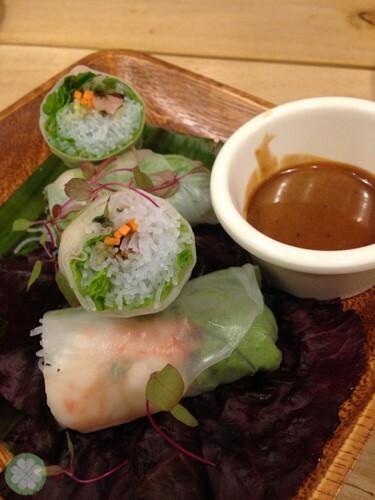 The delicate flavor infused in each roll was a surprise for me as I think all Fresh Spring Rolls taste the same. Tip: Dip it generously in the sauce. 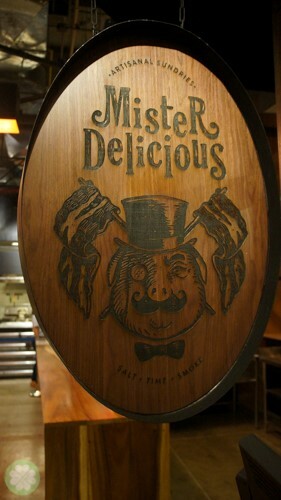 Mister Delicious is all about hefty sandwiches and beverages to pair it with. The look of MD kinda reminds me of a German pub sans the rowdy gentlemen and Irish cursing. Hihihi. 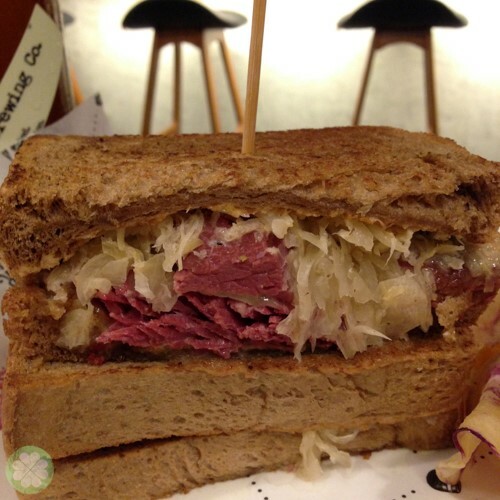 That slab of corned beef was the focus of my attention when I got my order from Mister Delicious. 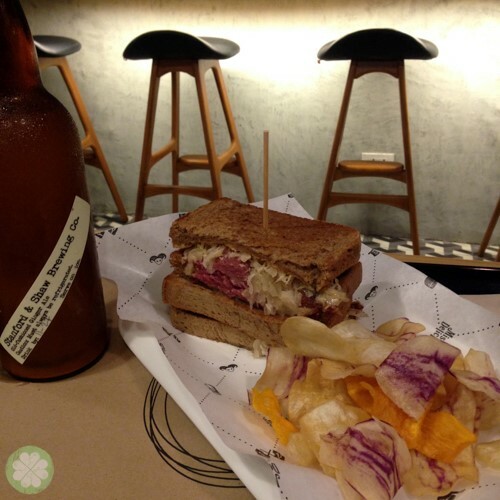 I felt though that it would’ve been better if there were more flavors to the sandwich but overall, it doesn’t really take away the fact that the corned beef was indeed tender. 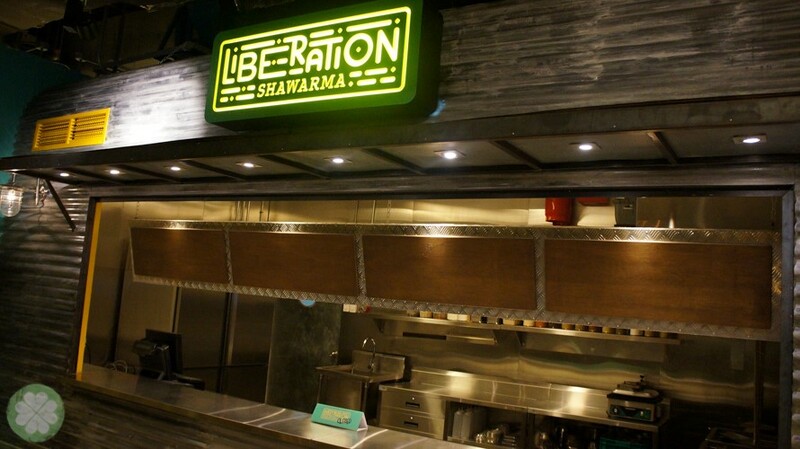 Must try some from their grill next time. Of all the times my body could no longer love chicken, why does it have to be now? 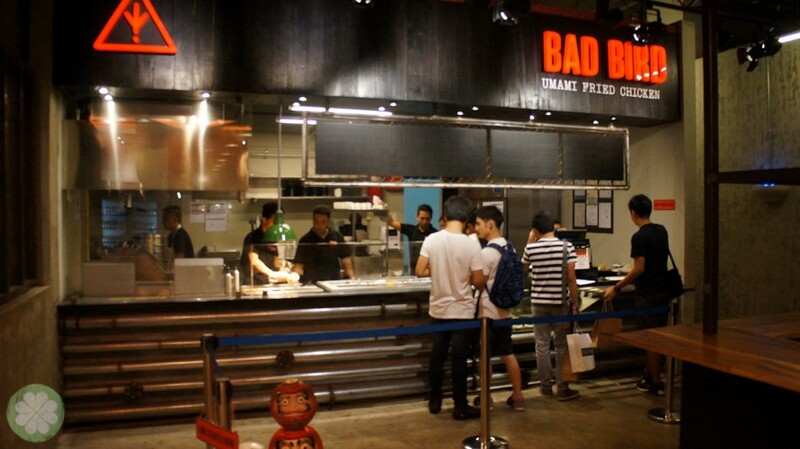 Such a wrong timing because the chicken from Bad Bird is da bomb! Sweet Potato Waffles with Miso Butter. Whuuut? It may sound so weird but it tastes darn good. I went for Spicy & Safe just so I can try both. 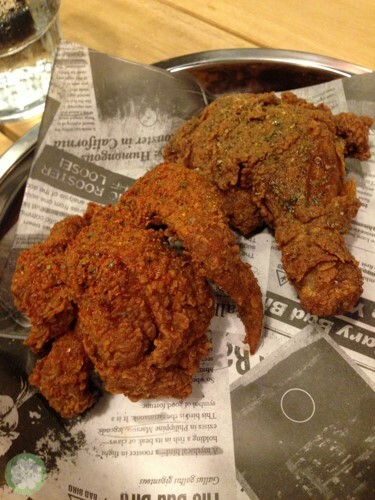 I love spicy food and Bad Bird’s spicy chicken is SPICY! 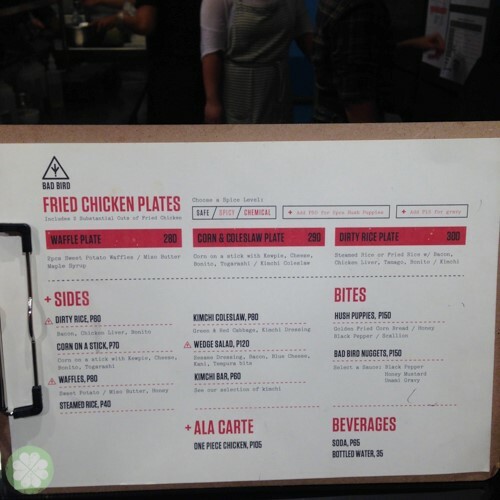 I don’t think I’m ready to try their Chemical chicken (suuuuper spicy daw). That umami batter left me wanting more. Sadly, I could only enjoy portions of it as my allergy started kicking in. Boooooo. 🙁 Whether you’re a chicken lover or not, I bet you’ll love Bad Bird. Sarap papakin ng skin. Ugh! 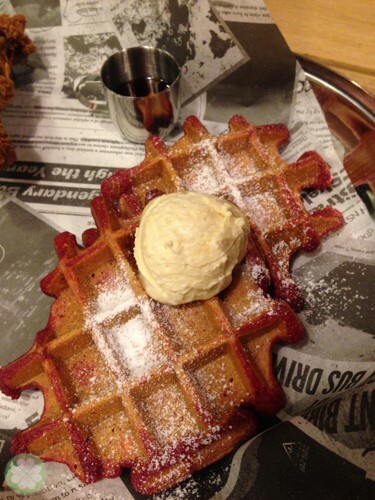 Not a waffle person? Then you must order Bad Bird’s dirty rice. 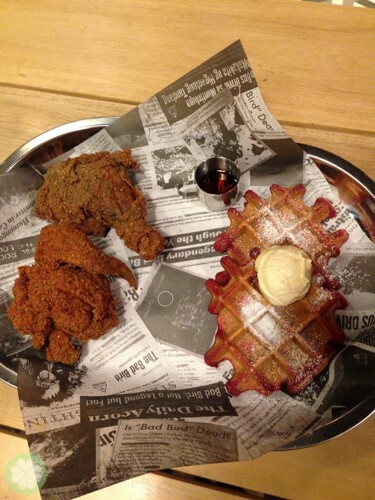 It has chicken liver (okay this may not be for everyone) but it also has bacon. Yeeeees! 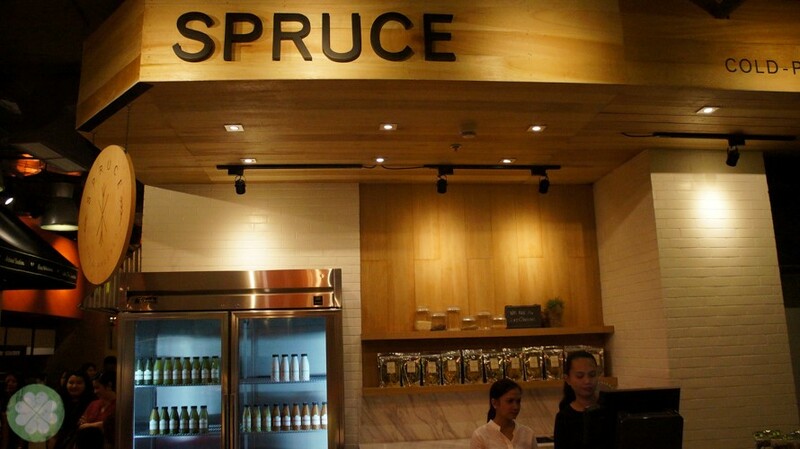 Cold-pressed juices perfect for those needing a dose of healthy. 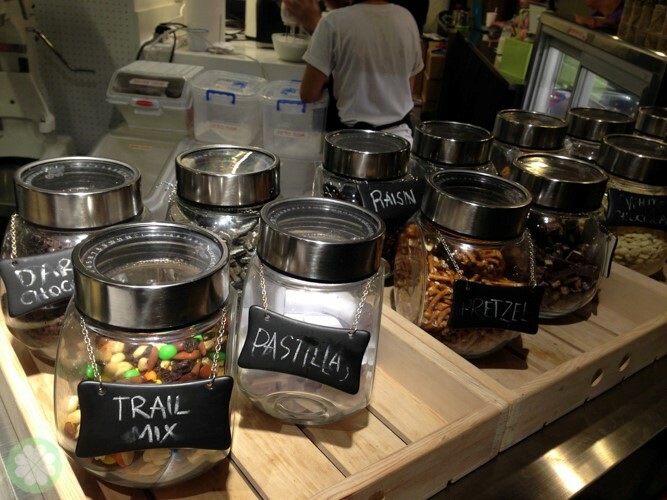 They also have Kale Mix Chips and other healthy snacks that you can munch while you down one of their freshly pressed juices. Their cuteness equates well to how delicious their eclairs are. Sorry, I wasn’t able to take a photo of the eclairs I got to take home as they were gone the moment they landed our home. Uuummmm Houston, we have a problem! No eclairs photos! Heehee. 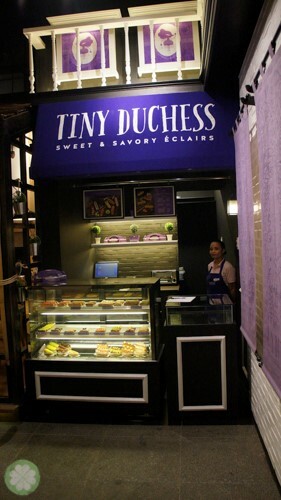 May I suggest for chocolate lovers like me to try Tiny Duchess Double Chocolate? It’s yummy, promise! 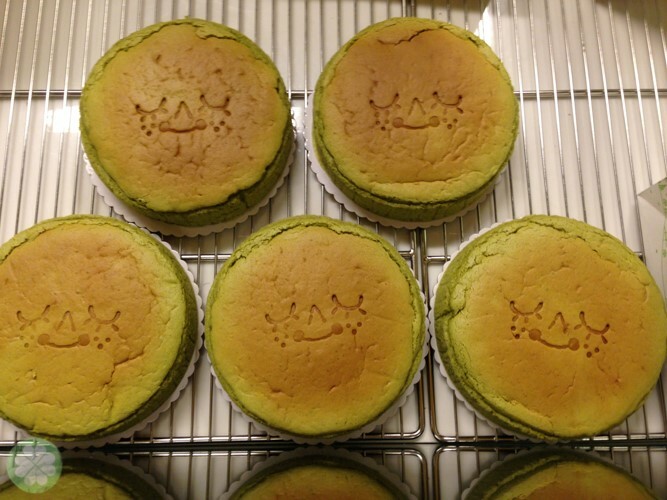 Green Cheese cheesecake is said to be the happiest cheesecake in the world. 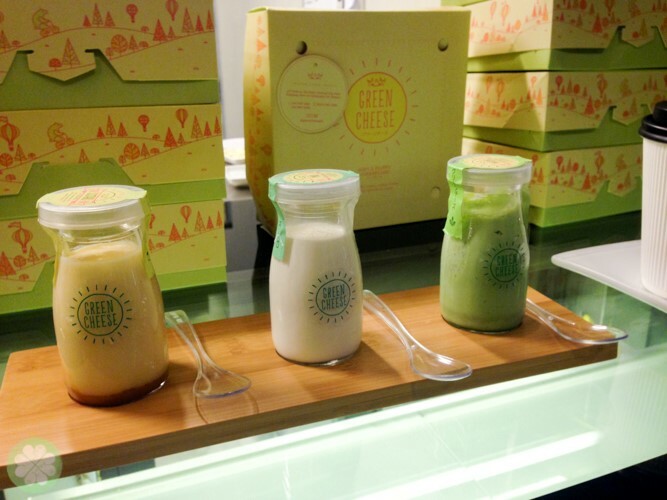 I was enticed & curious spotting how cute the cheesecakes were inches even before I reached the storefront. If sweetness is my weakness, imagine more if the sweetness is also packed with cuteness?! Too kyooot to eat! 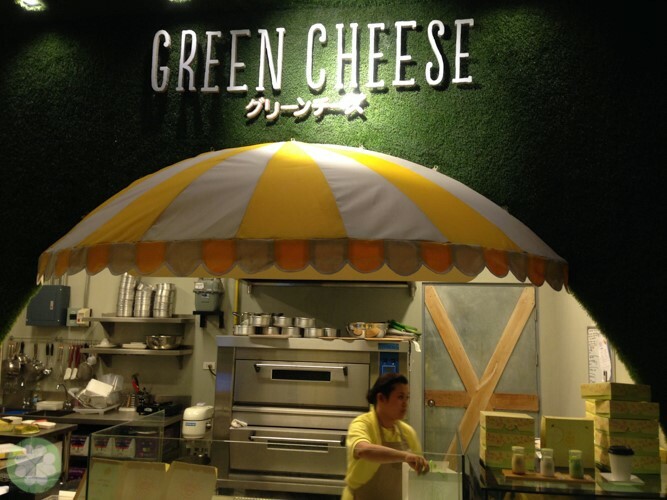 Green Cheese cheesecake is probably the most fluffy & airy cheesecake I’ve ever had. It had just the right amount of creaminess to it. Even my non-cheesecake lover Mr. GJG enjoyed a slice. 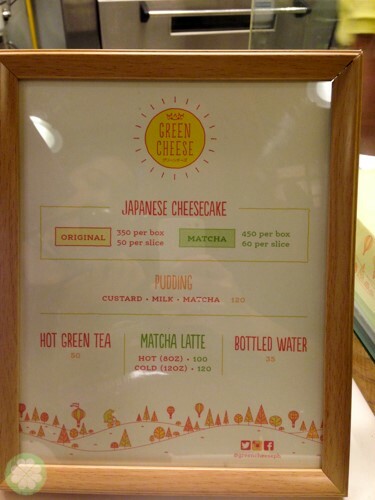 I shall try the milk pudding next time as well as their matcha cheesecake. I hope they make a smaller serving (a mini perhaps?) of their cheesecake or else, everyone who would try it will get fat! I cannot stop munching it for it was too good to stop. 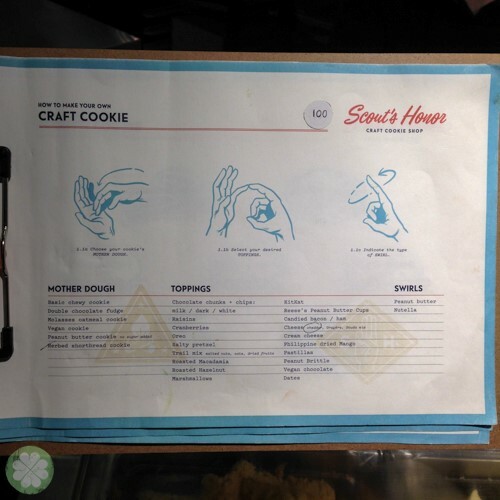 Craft your own cookie? Yes please! 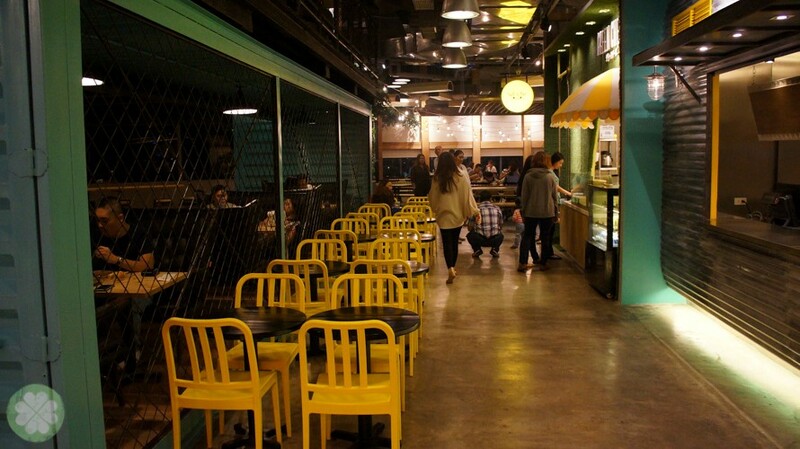 Finally, someone heard my prayer for more customised dessert shops. 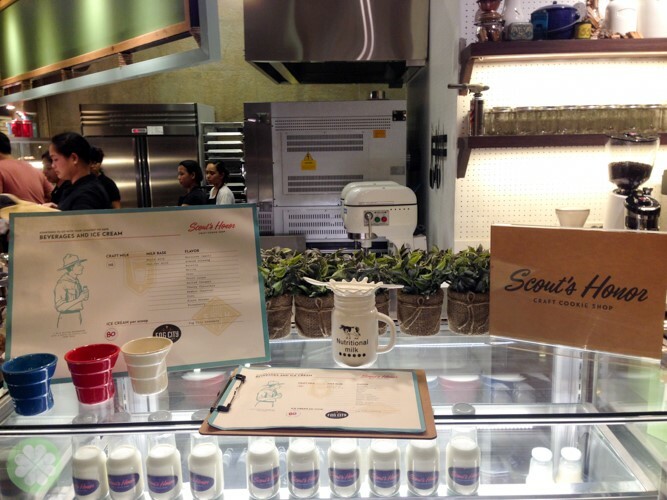 Chef Miko Aspiras, the man behind Scout’s Honor created the first ever Craft Cookie Shop in Manila. 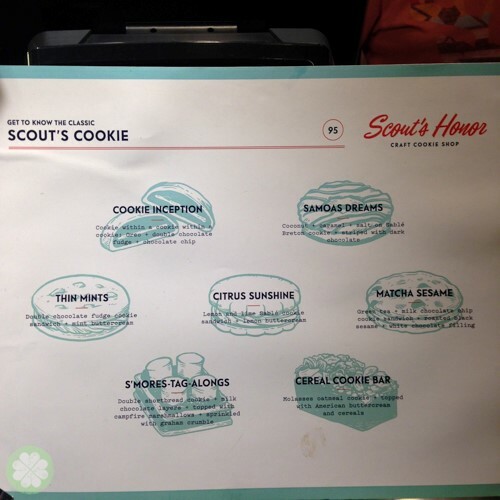 Some of Scout’s Honor’s offerings: Cookie Inception, Samoas Dreams, Matcha Sesame, Cereal Cookie Bar, S’mores-Tag-Alongs, Thin Mints and Citrus Sunshine. Cookie Inception, I’ll be back for you! So easy to craft your own cookie! I was like one of the contestant of Master Chef Just Desserts, as I was super excited to craft my own cookie, even though I really wasn’t the one literally crafting it. Still, the high it gave me knowing I can craft my own cookie was irreplaceable. 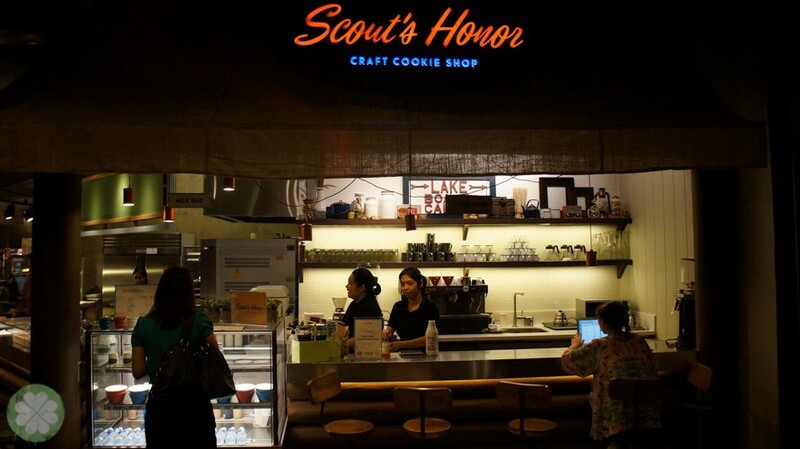 Cookie monsters, be sure to drop by Scout’s Honor to get your cookie fix okay? Three easy peasy steps in making your own cookie. 1. Choose your mother dough. You can opt for the basic chewy, vegan, peanut butter cookie, herb shortbread, molasses oatmeal, and double chocolate fudge. 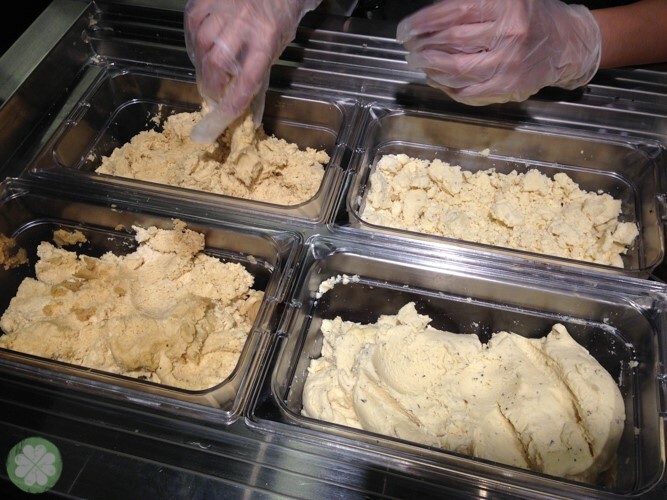 You can even mix these doughs to create the ultimate cookie you! Heehee. Your Scout’s Honor cookie can be savoury, sweet or both! 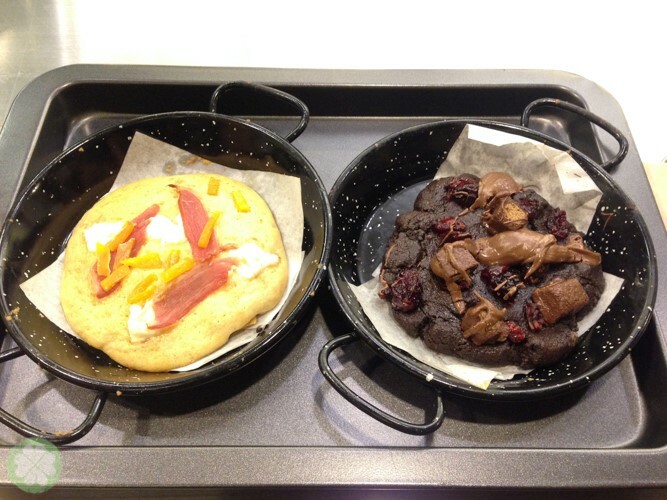 You can put three toppings to your cookie. I wish they have more options for this. The more the many-er merrier! 3. Watch as your cookie comes to life. Heeheeheehee. The frustrated baker in me couldn’t be more happier to see my cookie take form as the baker assembles it right in front of me. 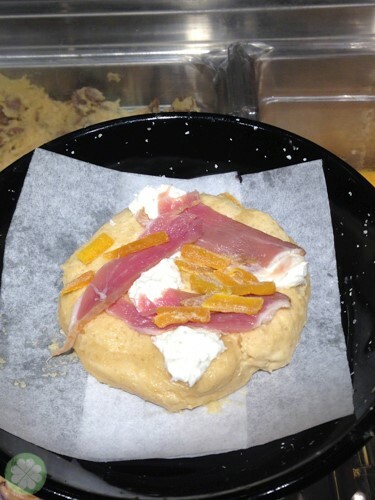 My savoury cookie: basic chewy cookie with cream cheese, bacon and dried mangoes. My sweet cookie: double chocolate fudge with Kitkat, cranberry and Nutella. It only takes 8 minutes for the cookies to bake. I was pretty excited to see how my cookies turned out so I patiently waited for until it was time for my babies to come out of the oven. These taste equally good as they look. Promise! Surprisingly the sweet, salty and tangy combination of cream cheese, bacon and dried mangoes harmoniously balanced the basic chewy cookie dough. 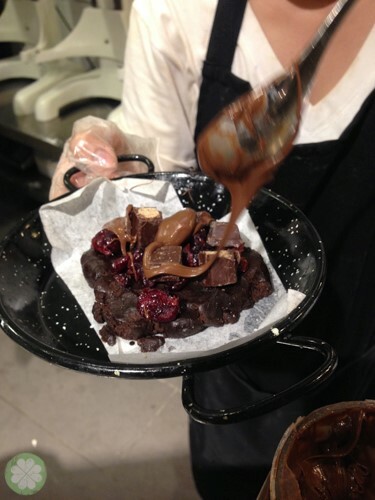 While my double chocolate fudge cookie was a no-brainer sweet & chocolatey treat! I cannot wait to go back and let my kids create their own cookies. Food coma! 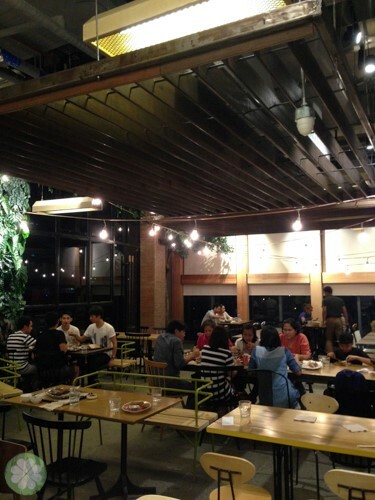 When you visit Hole In the Wall, be sure to bring your family or friends so you can get a taste of each dish you plan to order. Imagine, this is what Lil’ Mr. GJG & I ordered. NKKLK! And because he’s just 2 years old, it was mostly me (and Yaya H) who devoured all these. Burp! 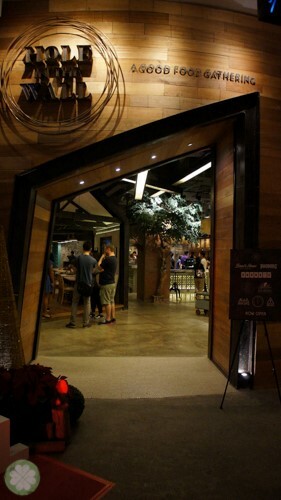 Don’t just stop at dinning at Hole In The Wall as Century City Mall has a lot in stored for their shoppers this holiday season. There are more reasons to #LoveChristmas at Century City Mall. Every Sunday of November and December, shoppers get to meet Kris Kringle himself as he roams the five-level mall. Santa will also be giving away gifts and holiday treats to random shoppers courtesy of Century City Mall’s generous tenants. Joining him is his special helper, a “reindeer dog”, which will be accepting donations in behalf of the Philippine Animal Welfare Society (PAWS). The festivities continue at the 4th level of Century City Mall al fresco area, where a giant Snow Globe awaits shoppers. Kids and kids at heart can enjoy the snow and have their photo taken inside its picturesque Winter Wonderland backdrop. You get a print out copy of your photo too! There’s also a daily fountain show which happens every 12 noon, 6 PM and 8 PM. You can also get serenaded with carols performed by non-profit organisations Handog ng Pagmamahal and Sheavers Assoication at basement 1 every Sunday until the last Sunday of December. Century City Mall also holds a regular Sunday Mass at 11 AM at its Event Center at the 5th level. 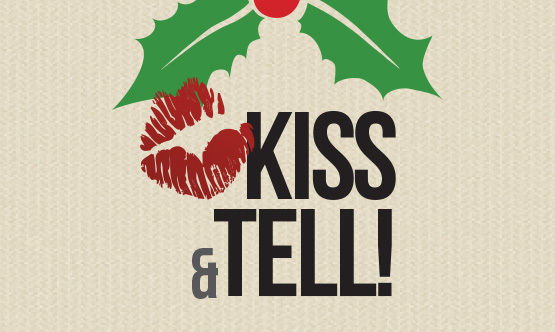 If you like to kiss and tell then you’d want to take a photo of yourself kissing underneath the mistletoe found inside Century City Mall. Be as creative as you can! You can post a photo of yourself or someone else smooching someone or something special. Post it on your Instgram and use the hashtags #KissandTell and #LoveChristmas and tag @centurycitymallph to enter the contest. Five winners will be chosen weekly for six weeks and each will receive 10 free cinema tickets! The ultimate offering of Century City Mall for mall rats and shopaholics! 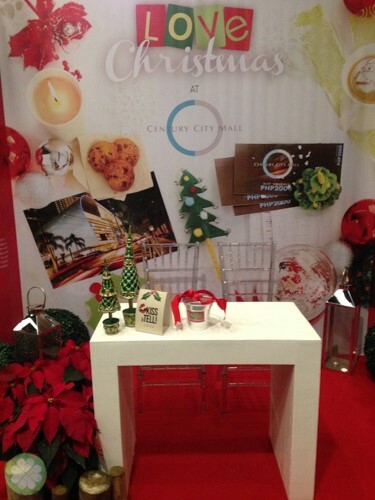 Century City Mall’s spirit of giving continues through its “Shopaholic Holiday” promo. Mark your calendars! 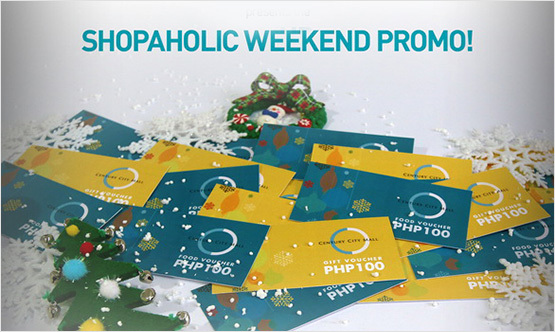 For every P10,000 worth of single OR accumulated purchase at Century City Mall stores on On NOVEMBER 29-30, 2014 and DECEMBER 13-14, 2014, the shopper gets P2,000 worth of Century City Mall vouchers. 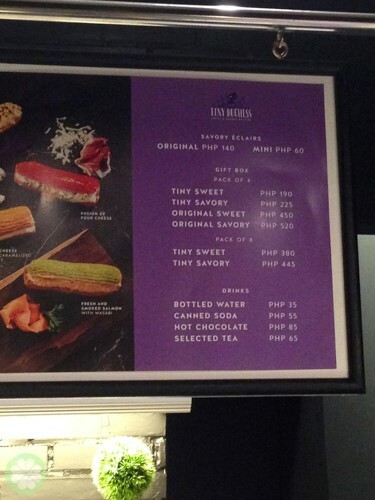 The vouchers come in P1,000 worth that can be used for food and dining and another P1,000 worth that can be used for shopping at Century City Mall. It’s an instant reward just because you shopped! If these aren’t enough reason to entice you to do your Christmas shopping at Century City Mall then I don’t know what will. If you haven’t started your Christmas shopping yet, go ahead and shop at Century City Mall during the Shopaholic weekends! 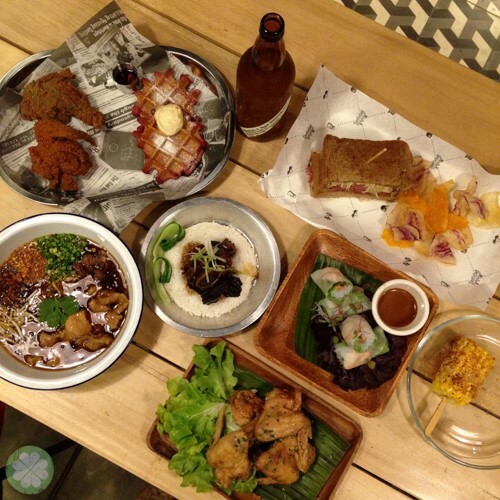 Don’t forget to indulge in some delicious food at Hole In The Wall for me okay? 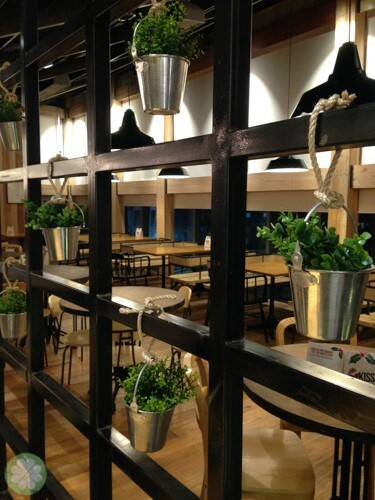 Happy shopping & dining!